Picture this.. you and your family driving to Grandmas enjoying the fall foliage and the cool breezes that fall bring. Bright lights, wonderful colors, clean pine scent in the air. But beware, danger is lurking. 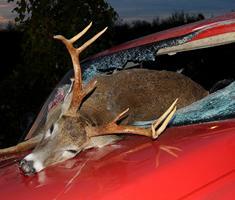 Deer-car collisions increase this time of year. According to the National Highway Traffic Safety Administration, there are about 1 million car accidents with deer each year that kill 200 people, cause more than 10,000 personal injuries and result in $1billion in vehicle damage. October through December are deer migration and mating season for North American deer, and more accidents occur during these months. State Farm Insurance tracks the trends nationwide and using its claims data took a look at the overall number of reported collisions in each state and weighed them by the total number of licensed drivers. This is what they found: While the number of miles driven over the past five years increased only 2 percent, the number of deer-vehicle collisions has grown by ten times that amount. West Virginia tops the list of states where a driver is most likely to collide with a deer. (The odds: 1 in 42). Iowa is second on the list at 1 in 67 followed by Michigan at 1 in 70. Be especially attentive from sunset to midnight and during the hours shortly before and after sunrise. These are the highest risk times for deer-vehicle collisions. Drive with caution when moving through deer-crossing zones, in areas known to have a large deer population and in areas where roads divide agricultural fields from forestland. Deer seldom run alone. If you see one deer, others may be nearby. When driving at night, use high beam headlights when there is no oncoming traffic. The high beams will better illuminate the eyes of deer on or near the roadway. Slow down and blow your horn with one long blast to frighten the deer away. Brake firmly when you notice a deer in or near your path, but stay in your lane. Many serious crashes occur when drivers swerve to avoid a deer and hit another vehicle or lose control of their cars. Always wear your seat belt. Most people injured in car/deer crashes were not wearing their seat belt. 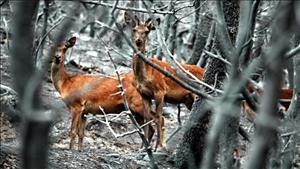 Do not rely on devices such as deer whistles, deer fences and reflectors to deter deer. These devices have not been proven to reduce deer-vehicle collisions. For more information on driving near wildlife, look into taking one of our state approved driver safety courses before heading over the river and through the woods.